February 2015 Gemini Horoscope predicts that career and personal achievement will dominate over family and domestic concerns. Most of the planets are in the Western sector of your birth chart which also has the influence of your rising sign. Hence cooperation of other people will be a necessity. You should avoid conflicts with other people and be flexible to be in harmony with situations and environment. If you are in the creative field such as writing, you will have an excellent month. If you are interested in education and travel, you will have plenty of occasions to travel and study. The Gemini February 2015 career forecasts predict that this is a fabulous month for accomplishing your goals in your profession. You have to decide what you want and it will happen. The February 2015 financial horoscope for the Twins is not particularly favorable for this month. First half of the month will see good cash flow from many sources. Some of the money may come from sources unknown to you. Know more from the horoscope 2015 predictions. The February 2015 love predictions for Gemini zodiac sign foretell that love relationships will be more physical and turbulent. Singles will find many opportunities to start dating. You might get into relationships and may face challenges in existing partnerships. Family matters will involve improvement of spiritual health and trips to religious destinations with loved ones. If you are planning for a baby, this might not be a fortunate month. 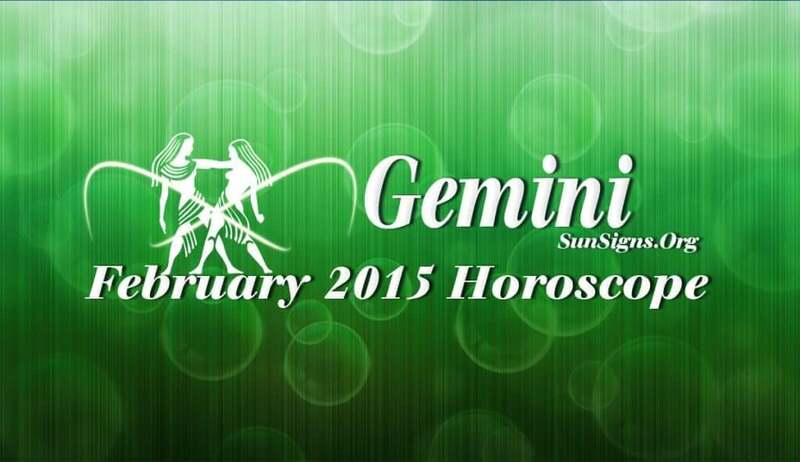 The Gemini monthly horoscope for 2015 February predicts that health will be delicate during the month. Adequate relaxation and prioritizing important things during the second half is recommended. If you are tensed, go in for some alternative healing methods to reduce your stress.